Hi my name is Evan Roberts, My rank is around 10kyu and have been steadily improving at around 1 rank every couple of weeks. I first played go against my parents when I was young, but only this last year since I've joined the local club at uni have I picked up the interest again. 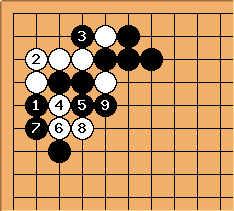 When I joined I was only ~19kyu, so playing regularly has improved my game a lot. I think when playing in real life I probably play a little better as I don't make quite so many silly mistakes. 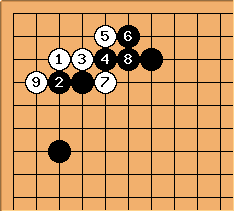 I can beat players around 3kyu when taking 4 stones. I play on KGS as "Wellred" or sometimes "Evan"
Still without internet at home so haven't been playing online much recently. The result of this is me playing a game or two against GNU go most days, with me improving to the point that I can usually beat it with a 4 stone handicap. Today though it caught me out with my corner invasion dying. 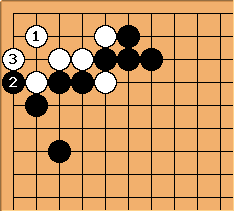 This is a standard sequence for this invasion, and is normally not so great for Black. 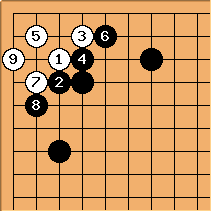 If Black loses the ko it's awful, if she wins the ko, she has played an extra move in the corner. Just lost another game due to running out of time! That's about 10 games now, must get better at keeping track of the clock, and generally learn to play faster. For christmas because my parents have abandoned giving me presents, I decided to buy myself one instead. Which works out well because I could buy exactly what I wanted - A go set! I bought the Play Go Today 3 set, two dark bowls, and two books "get strong at tesuji" and "get strong at life and death" which I've accidently left behind up in scotland. The bowls and glass stones I am very pleased with; the board isn't the best quality ever, but I needed one that splits in half so I could take it with me on the train. I'll report on the books when I get them sent back down from scotland!